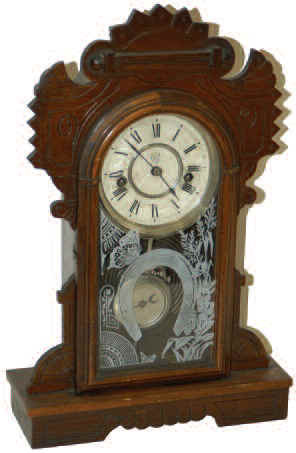 Waterbury Clock Company, miniature walnut parlor clock, the "Corona", ca 1890. Stands only 17 inches high, complete and original throughout, two label on the back, special pendulum with a slow-fast adjuster, glass near perfect, original key, and original dial and hands. Movement runs one day and strikes a coil gong each hour. We do not get 110-year-old clocks any nicer than this one. Ly-Waterbury No. 1702.